A total of 19 teams participated in Red Eye 2017, making this another record-setting year. 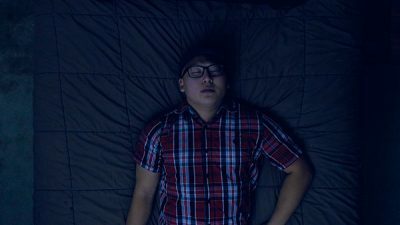 Student teams from Bethany Lutheran College, South Central College, and Minnesota State University-Mankato were given one week to create a short film based on randomly assigned prompts that each include a genre, character, and prop. Faculty members from each of the schools adjudicated the festival, and seven awards were given. It was a competitive year with each school represented among the winners. This was the first year that staff and faculty members from each institution participated in a feedback panel following the showcase. The interdisciplinary panel included Angie Johnson (English, BLC), Wes Taylor (Art/Multimedia, SCC), Nick Hauman (Sociology, BLC), and Kurt Shrader (film, BLC). Their conversation included tips on how to “copy like an artist” and connect with today’s audiences. They also reacted to this year’s unusually bloody entries with a discussion of violence in media.